Ashtanga, or the father of vinyasa yoga, is a vigorous style that blends fluid movement with static postures. This is an Ashtanga-inspired yoga flow that draws from the primary series and works to unite the body, mind, and breath. Mindfully follow the detailed guidance through a dynamic, straight-forward, and energizing practice. This specific sequence of postures really emphasizes proper alignment to achieve a deeper understanding of this practice we call ‘yoga.’ For each of the asanas, take five full breaths in and five full breaths out before moving forward. If you’re craving an extra challenge, incorporate a vinyasa between each of the standing postures. This practice begins by warming the body with three to five rounds of both Sun Salutations. During the salutations, focus on finding fluidity in your movements by connecting them to the breath. Stand tall at the head of your mat with big toes touching and heels slightly apart. Inhale – Sweep the arms overhead and bring your gaze towards the ceiling. Exhale – Hinge at the waist and fold forward. Inhale – Shift the gaze forward, bring fingertips to shins, and lift halfway with a flat back. Exhale – Plant the palms, step back to a high plank, and lower halfway down. Inhale – Sweep through an Upward Facing Dog or Cobra if you need to warm up the backbend. Exhale – Press the hips up and back to a Downward Facing Dog. Suyra Namaskar B — Sun Salutation B PoseStand tall at the head of your mat with big toes touching and heels slightly apart. Inhale – Sink the hips low and raise the arms overhead for Chair Pose. Inhale – Sweep through an Upward Facing Dog. Inhale – Step your foot forward and rise up for Warrior I pose. Inhale – Step or hop forward and halfway lift the spine. Exhale – Stand tall in Mountain Pose. Find a forward fold with both hands on the floor (bend the knees as needed). Flip both hands palm face up and slide them under the feet so the toes meet at the wrist joint. Begin to fold towards the legs as you draw the elbows out to the sides. Engage the legs to release the lower back. Stand tall at the head of your mat. Exhale and step the left foot back so the feet are roughly three to four feet apart. Raise your arms parallel to the floor and reach equally through the fingertips in both directions. Turn your left foot in slightly and aim your right toes towards the front of the mat. Exhale and reach your right fingertips straight over the right leg. Rest your right hand on your shin, ankle, or a block. Reach your left arm straight up towards the ceiling. Hold for thirty seconds and repeat on the other side. Exhale and turn your torso towards the right, leaning forward over the front leg. Reach your left hand down to either the floor or a block outside the right foot. Extend your left hand towards the ceiling, possibly allowing the gaze to follow. Turn your left foot in and aim your right toes towards the front of the mat. Exhale and bend your right knee over the ankle. Bring your right hand down to the floor or a block on the inside of the front foot. Inhale the left arm overhead. Exhale and step the feet three to four feet apart. Rest both hands on your hips. Inhale and lift the heart. Exhale and hinge forward at the waist. Bring your fingertips to the floor and slowly bend the elbows into a full fold. Hold for one to three minutes. From the head of your mat, step your left foot back about one legs length. Point your right foot forward and dial your left toes out slightly. Square your hips forward as you bring the hands to reverse prayer (or grab opposite elbows) behind your back. Exhale and hinge forward until your spine is parallel with the floor. Fold deeper towards the front leg only if you have the flexibility to do so. 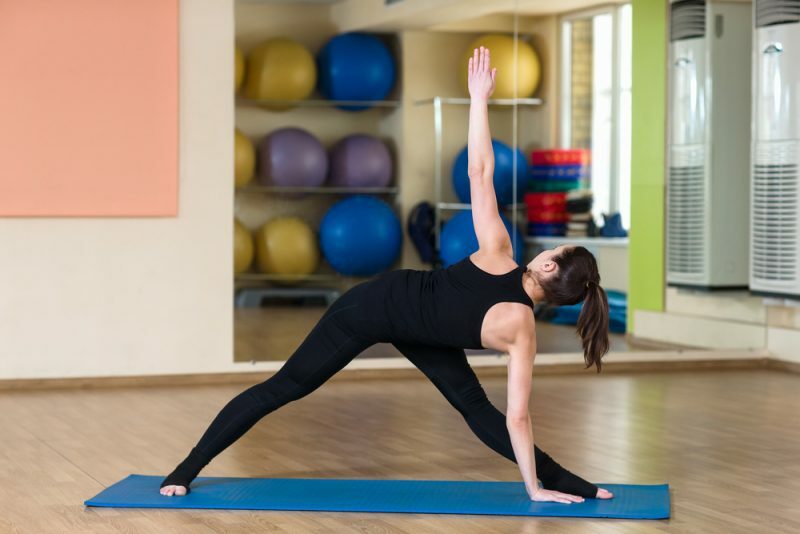 Standing at the front of your mat, bring your right knee towards your belly. Reach your right arm inside the thigh and grab the right big toes with your peace fingers. Inhale and extend the right leg forward, straightening the knee as much as possible. If you feel steady, open the leg out to the right. Bring the leg back through center. Release slowly and repeat on the other side. Remove any extra flesh from the sit bones and actively root the legs down. Inhale to draw the belly up and in. Exhale to lengthen the torso over the legs, using the energy of the lower body to deepen the fold. 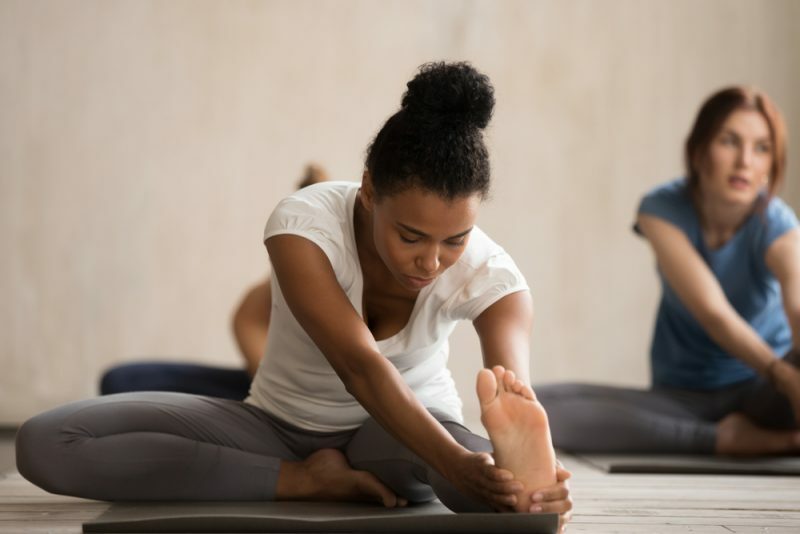 Sit on the floor with your legs bent and feet on the floor. Plant your palms several inches behind the hips with fingers pointing towards the toes. Exhale and press into the hands and feet to find an upward tabletop position. Continue to lift your hips as you straighten the legs one at a time. Slowly drop the head back and hold for thirty seconds. Find a seat with the right leg extended and the left foot against the inside of the right thigh. Inhale the arms overhead, lengthening the spine and waist. Exhale over the right leg, bending the knee as much as necessary. Relax the muscles of the shoulder, neck, and face while pressing the head towards the right knee. Sit with your right leg extended and your left knee bent with the foot tight to the left sit bone. Inhale to stretch your left arm forward and rotate it inward, so the thumb points to the floor and the palm faces to the left. On an exhale, sweep the left forearm around the outside of the left leg. Press the left hand against the outside of the left thigh. On another exhale, sweep your right arm behind your back and hold the right wrist with the left hand. Lower the torso towards the right leg on a breath out. Start in a seated position with knees bent and your feet flat on the floor. Slowly lift your feet from the floor, keeping your knees bent and bringing your shins parallel to the floor. Keep your spine straight as you lengthen the legs to a 45-degree angle. Roll your shoulders back and straighten both arms in front of you with your palms facing up. Continue to balance on the sit bones and breathe for thirty seconds. From a comfortable seat, bend the knees and bring the soles of the feet together as you let your knees drop to either side. Draw your feet in as close to your body as is comfortable. Press the outer edges of your feet together. Sit tall with a long spine while keeping your shoulders soft. Lie on your back with knees bent and soles of the feet close to the sit bones. Bend your elbows and bring the palms underneath your shoulders with fingertips pointing towards the feet. Inhale and press into your palms and your feet simultaneously as you lift your shoulders and hips off the floor. With elbows parallel, bring the crown of your head to the mat. Straighten your arms to lift your head off the floor. Reach your heart towards the wall behind you as you work to straighten the legs. Hold for thirty seconds to one minute. Tuck your chin into your chest and lower down slowly. Using two folded blankets, come into Plow Pose with your back and shoulders resting on the blankets and your head on the floor. From Plow Pose, bend your elbows shoulder-width apart and bring your hands onto your lower back with your fingertips facing upward. Lift your feet toward the ceiling, bending the knees to start if necessary. Lift up through the balls of the feet and keep the gaze upward. Straighten the body by moving your hips toward the front of the room and your feet toward the back. Continue breathing here for one to three minutes. To exit the posture, bring the feet back overhead and come through Plow Pose. Slowly roll out from Plow Pose. Lie on your back with legs straight and arms at your sides. Rest your hands slightly away from your body with your palms facing up. Let your feet drop open to the sides. Close your eyes and let your eyes drop back into the head. Connect to the natural rhythm of your breath as your body melts into the ground. Welcome peace and stillness into your body and mind. For every thirty minutes of yoga practice, rest in Savasana for five minutes.